Hey pals, this is the last of our summer rerun series. You knew we would pick at least one silly episode but this week we actually took things seriously. 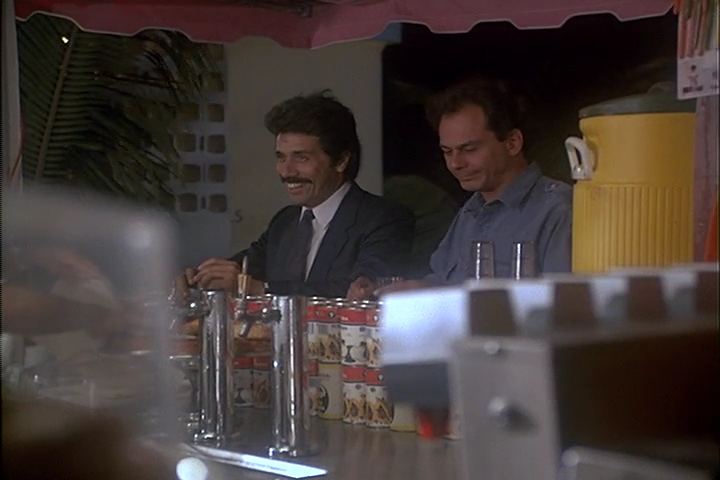 This was an amazing episode of Miami Vice and easily in our top episodes of the entire run of the show. We’ll be back next week with the first episode of season 5 titled “Hostile Takeover”. Programming note! We are shuffling the schedule slightly. Starting with season 5 we will be publishing the podcast on Monday’s instead of Friday’s. This will be such a nice change and the perfect way to start your week. So that means the next episode will hit your feeds on Aug. 27. With this change we’ll also be adding more Miami Vice goodness each week with some new content! Stay tuned. See you in just a few days! So we’ve had a couple of not-so-great episodes of Miami Vice in a row now, but that trend ends with this one. This is an amazing episode of Vice and we all thoroughly love it. Its not the most Miami Vice episode, but it is politically and topically important both in the late 80’s and today. Needless to say, we’re huge fans of this one and spend most of our time gushing. At least we get a good one right before the UFO’s come to take us away. John goes deep in the music and has some words of advice for Book of Love. Melissa is happy to see Castillo happy, even if its only for a few minutes. Dominic loves Crockett’s boating style. Its an episode of Miami Vice that harkens back to Season 1 and we love it.